Former President Estrada was granted an absolute pardon that fully restored allhis civil and political rights, which naturally includes the right to seek public elective office, the focal point of this controversy. The wording of the pardon extended to former President Estrada is complete, unambiguous, and unqualified. It is likewise unfettered by Articles 36 and 41 of the Revised Penal Code. The only reasonable, objective, and constitutional interpretation of the language of the pardon is that the same in fact conforms to Articles 36 and 41 of the Revised Penal Code. The pardoning power of the President cannot be limited by legislative action. For this reason, Articles 36 and 41 of the Revised Penal Code should be construed in a way that will give full effect to the executive clemency granted by the President, instead of indulging in an overly strict interpretation that may serve to impair or diminish the import of the pardon which emanated from the Office of the President and duly signed by the Chief Executive himself/herself. The said codal provisions must be construed to harmonize the power of Congress to define crimes and prescribe the penalties for such crimes and the power of the President to grant executive clemency. All that the said provisions impart is that the pardon of the principal penalty does notcarry with it the remission of the accessory penalties unless the President expressly includes said accessory penalties in the pardon. It still recognizes the Presidential prerogative to grant executive clemency and, specifically, to decide to pardon the principal penalty while excluding its accessory penalties or to pardon both. Thus, Articles 36 and 41 only clarify the effect of the pardon so decided upon by the President on the penalties imposedin accordance with law. A close scrutiny of the text of the pardon extended to former President Estrada shows that both the principal penalty of reclusion perpetua and its accessory penalties are included in the pardon. The first sentence refers to the executive clemency extended to former President Estrada who was convicted by the Sandiganbayan of plunder and imposed a penalty of reclusion perpetua. The latter is the principal penalty pardoned which relieved him of imprisonment. The sentence that followed, which states that "(h)e is hereby restored to his civil and political rights," expressly remitted the accessory penalties that attached to the principal penalty of reclusion perpetua. Hence, even if we apply Articles 36 and 41 of the Revised Penal Code, it is indubitable from the textof the pardon that the accessory penalties of civil interdiction and perpetual absolute disqualification were expressly remitted together with the principal penalty of reclusion perpetua. In this jurisdiction, the right to seek public elective office is recognized by law as falling under the whole gamut of civil and political rights. The third preambular clause of the pardon did not operate to make the pardon conditional. Contrary to Risos-Vidal’s declaration, the third preambular clause of the pardon, i.e., "[w]hereas, Joseph Ejercito Estrada has publicly committed to no longer seek any elective position or office," neither makes the pardon conditional, nor militate against the conclusion that former President Estrada’s rights to suffrage and to seek public elective office have been restored. This is especially true as the pardon itself does not explicitly impose a condition or limitation, considering the unqualified use of the term "civil and political rights"as being restored. Jurisprudence educates that a preamble is not an essential part of an act as it is an introductory or preparatory clause that explains the reasons for the enactment, usually introduced by the word "whereas. Whereas clauses do not form part of a statute because, strictly speaking, they are not part of the operative language of the statute In this case, the whereas clause at issue is not an integral part of the decree of the pardon, and therefore, does not by itself alone operate to make the pardon conditional or to make its effectivity contingent upon the fulfilment of the aforementioned commitment nor to limit the scope of the pardon. 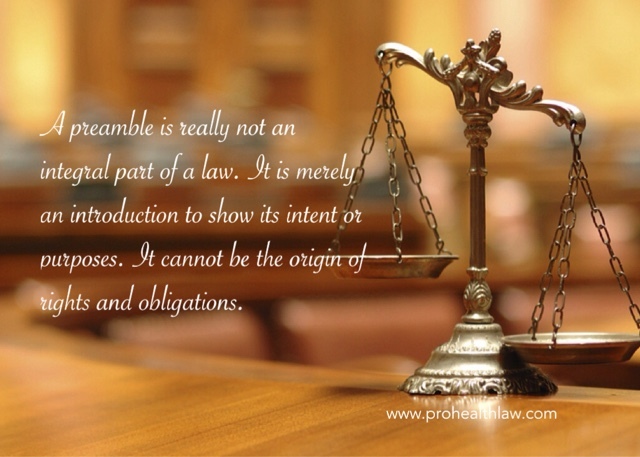 Besides, a preamble is really not an integral part of a law. It is merely an introduction to show its intent or purposes. It cannot be the origin of rights and obligations. Where the meaning of a statute is clear and unambiguous, the preamble can neither expand nor restrict its operation much less prevail over its text. If former President Arroyo intended for the pardon to be conditional on Respondent’s promise never to seek a public office again, the former ought to have explicitly stated the same in the text of the pardon itself. Since former President Arroyo did not make this an integral part of the decree of pardon, the Commission is constrained to rule that the 3rd preambular clause cannot be interpreted as a condition to the pardon extended to former President Estrada. Absent any contrary evidence, former President Arroyo’s silence on former President Estrada’s decision torun for President in the May 2010 elections against, among others, the candidate of the political party of former President Arroyo, after the latter’s receipt and acceptance of the pardon speaks volume of her intention to restore him to his rights to suffrage and to hold public office.